To add photos to your ad, login to your Daft account. You will be brought to the 'My adverts' tab within your account. Under the 'Active ads' heading, you will see your ad. 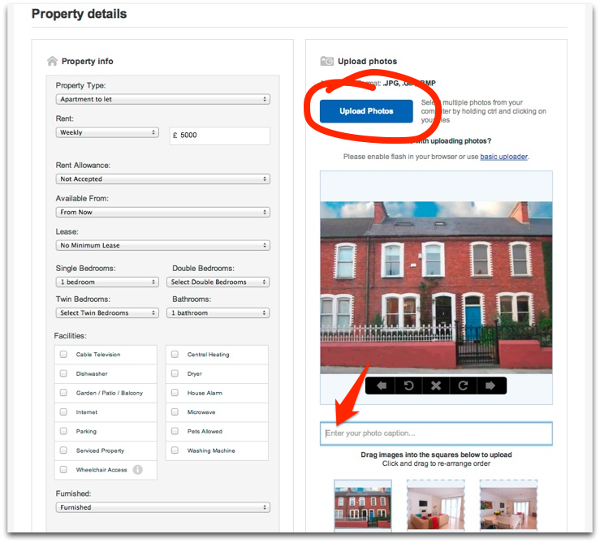 Under the properties price you will see an 'Edit ad' option. You will be brought to the first page of the edit ad process. To add photos click 'Next' and you will be brought to the edit property details page. The ad photos section is on the right of the page. Select the 'Upload photos' button pick the photos you wish to upload. Hold Ctrl to select more than one photo. Then select open and the images will upload. Alternatively you can drag images into the square boxes below the main image to upload. To enter a photo caption for each photo select the free text box underneath the main photo. To change photo use the left and right cursors. Once you have made your changes scroll to the bottom of the page and click 'Save'.